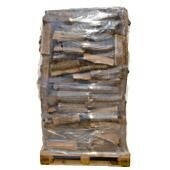 All our firewood comes from pruning, thinning or crop changes and follow a careful production process. At Legua, the wood is dried outdoors at our warehouse in Foyos (Valencia), with the natural heat of the Mediterranean sun and for a period of no less than 8 months. Why is it so important to dry the wood? 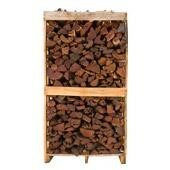 Dry wood, with a water content ranging as a rule from 15% to 20%, provides fast, clean fire. The fire does not have to overcome the moisture barrier and the wood catches fast, directly and consistently. The yield is therefore much greater. The drying process allows moisture to evaporate from the timber, causing the wood to catch more easily and provide efficient heat. The most appropriate drying is carried out naturally, using sunlight and air, for a period of not less than 8 months. 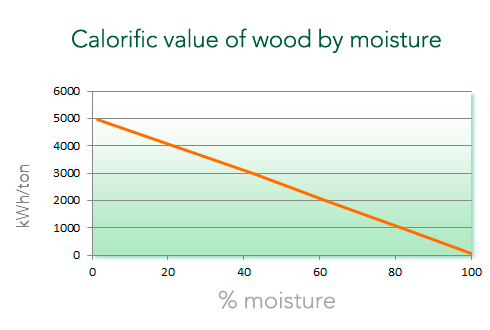 Dry wood provides more efficient use of calories than wet. You cannot talk about exact weight in wood, as it constantly loses moisture and this makes it vary in weight. Therefore Legua sells firewood by volume. Depending on environmental conditions and temperature, the wood will lose moisture more or less rapidly. In line with other countries at a European level, volume is taken as a parameter for measuring the wood, the weight being simply informative.. This is a fast-burning wood, providing fire with a lot of flame to help catch quickly. 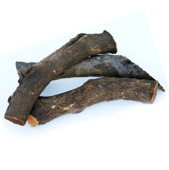 Being a fast-burning wood, it is a very suitable to start the fire in wood-burning stoves and heaters, later being combined with harder woods to maintain the force of the fire. Included within the category of hardwoods due to its high calorific value (4678 Kcal / kg), so it is widely used for heating..
Holm oak wood is well known and appreciated in Spain. With a high density, it belongs to the hardwoods, and has a calorific value of about 4548 Kcal / kg. Oak belongs to the same family as Holm oak, with a thicker bark and a more yellowish colour. It also belongs to the hardwoods, with a calorific value of approximately 4,619 kcal. 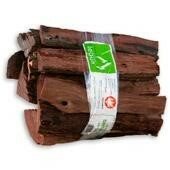 This is the quintessential Argentine firewood because of its high specific weight (1200 g / m 3) and its 7,300 kcal. Without a doubt, the tastiest barbecues are cooked with wood. Wood is a natural, clean fuel. When wood is burned it gives off aromas that permeate the food being cooked. The taste of these foods is naturally enriched with these exquisite nuances. This is a fast-burning wood, providing fire with a lot of flame to help cook fast. Orange wood is very aromatic; in fact it is frequently used for the preparation of essences and perfumes. This feature makes it very suitable for the preparation of the best paellas. 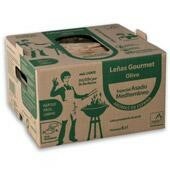 A good orange wood fire and good ingredients will undoubtedly result in one of the best dishes of Mediterranean cuisine. Olive wood is one of the most appreciated worldwide. The fruit of this tree is the olive, which gives olive oil, with well known beneficial properties for the body. 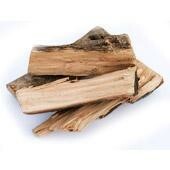 On burning, this firewood gives off unique aromas that make it highly demanded for stews, oven roasts and barbecues. It is included in the category of hardwoods due to its high calorific value (4678 Kcal / kg), and is therefore also widely used for heating..
Holm oak wood is well known and appreciated in Spain for cooking. Its fruit is the acorn, the staple diet of the Iberian pig. 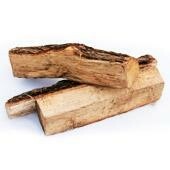 The sap of this wood is released during combustion and gives a distinctive flavour to roasts. 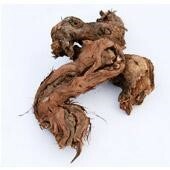 It is the wood commonly used for the preparation of roast suckling pig and roast lamb. With a high density, it belongs to the hardwoods, and its calorific value is about 4548 Kcal / kg. Oak wood belongs to the same family as Holm oak, with a thicker bark and more yellowish colour. Due to its rich aroma, this wood is used in the manufacture of barrels for aging wine. Foods such as beef jerky smoked with oak wood are an example of the unique flavour this wood adds to food. It also belongs to the hardwoods, with a calorific value of approximately 4,619 kcal. 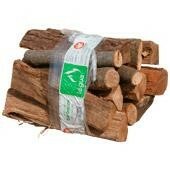 This is the quintessential Argentine firewood because of its high specific weight (1200 g / m 3) and its 7,300 kcal. The secret of why the Argentine barbecue is the most appreciated in the world is not just about the good quality of Argentine meat, but also about the embers of this wood, which are long-lasting and give off unique aromas. Grape and vine are very exquisite woods, commonly used in delicatessen food. When burned, the wood gives of rich aromas and roasts are impregnated with them. The vine provides rich wines and its wood great barbecues. To grill with this type of wood it is recommended to combine it with harder wood or charcoal to provide the strength of the embers and, finally, give a special touch with the grape or vine.